Is it permissible for a woman to wear the burqa’ (a kind of face veil) when in ihraam? 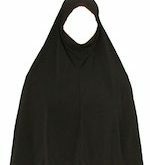 My family wore it and when they came back from Hajj they were told that their Hajj was not acceptable, because they wore the burqa’. Wearing the burqa’ is not permissible for a woman in ihraam, because the Prophet (Sallallaahu ‘Alayhi wa Sallam) said: “Women should not wear niqaab or gloves.” [al-Bukhaari]. But there is no sin on a woman who wears the burqa’ in ihraam because she is unaware of the prohibition, and her Hajj is valid. Fataawa al-Lajnah al-Daa’imah li’l-Buhooth al-‘Ilmiyyah wa’l-Ifta (11/190-192).